When you are planning a﻿﻿ long ﻿﻿hike or camping trip, you can’t just grab some energy bars and a bottle of water – there is a lot more to hiking nutrition like that. The longer you are planning to be out walking, the more food and water you are going to need, and energy bars are not always the best solution. Hiking nutrition is important to plan and carefully consider, hence I have compiled this handy guide. It contains the top five snacks that will keep your energy up while you are out hiking, so make sure you have a good read and prepare yourself for your next trip. With these snacks, you’ll be hiking like a pro. How much space do you have for food? Are you able to bring a cooler with you? Will you need any cutlery (like a spork)? Do you have enough space for water? While this guide has a primary focus on the importance of snacks, staying hydrated is also essential. You should be carrying a lot of water with you, especially if the weather is going to get hot and humid. Before you leave for your hike, it is recommended that you drink around four glasses of water to book your hydration levels. By doing this, you will not have to carry as much water with you, and you won’t feel thirsty as quickly. However, after drinking your four glasses and heading out, you should try and make sure that you drink an additional two glasses of water every hour to keep on top of your hydration levels. Can I Bring Perishable Foods? In this guide, we are only looking at the best snacks for your hike as opposed to foods that you should bring for trips that last a few days. So yes, it is possible to bring things like sandwiches, as long as they are kept cool either by an ice pack or a cooler. There’s nothing worse than a warm sandwich to put you at risk of food poisoning. 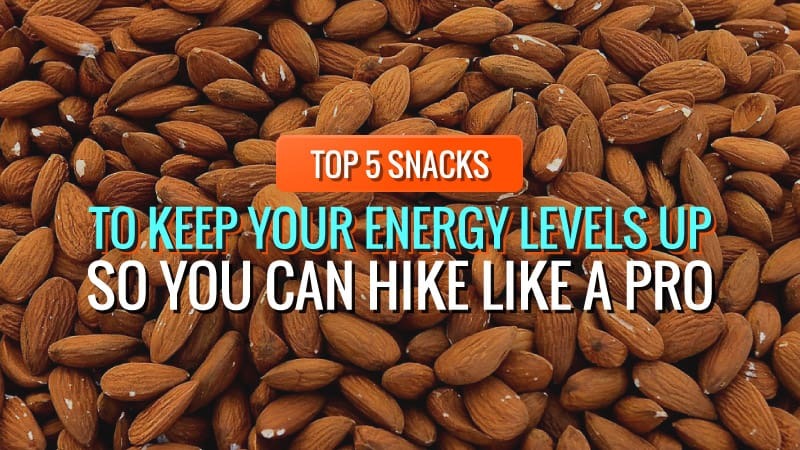 Without any further ado, here are the top five snacks that will keep your energy up while you are out hiking. While the most classic jerky flavour is beef, it also comes in poultry and fish forms as well. High in protein, it is the number one snack to take with you. 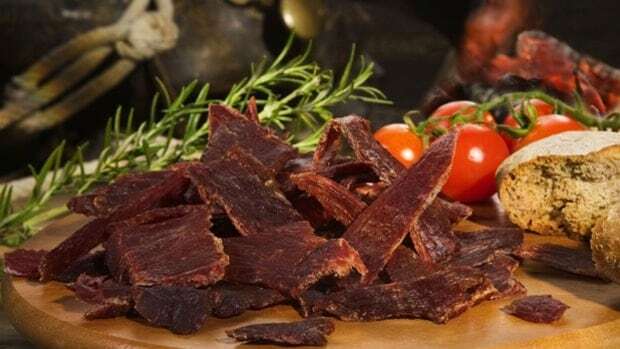 After all, dried meat has been a staple for survival throughout history. In fact, it was initially created to keep people nourished while travelling for trade, immigration, or general exploration. It is popular due to its long shelf life, low-fat levels, and the fact that it is packed with essential nutrients. Just make sure that you bring lots of water with you, as the one downside to the majority of jerky brands is that they can leave you feeling a little thirsty. 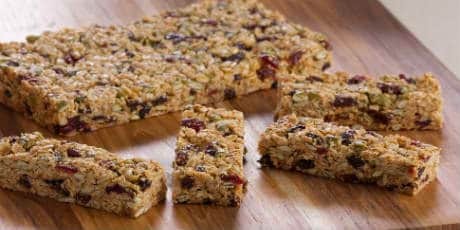 Generally, if you decide to purchase granola bars, they are usually packed with a variety of other ingredients to help boost your energy levels – alongside some delicious fresh fruits. Raw granola and fresh yoghurt are probably best eaten before you go hiking, but if you have room for a Tupperware tub and a spoon, then you could consider bringing it along with you. With these classic ingredients, you can easily make your trail mix yourself, and at a very low cost. Many camping and hiking stores will have their own trail mix on sale, but this tends to be incredibly expensive, especially when compared to the price of making it yourself. Plus, trail mix takes about 10-seconds to make. These are another staple snack that you should be bringing with you on your hike. They are an excellent energy booster, and also contain essential nutrients to keep you going. 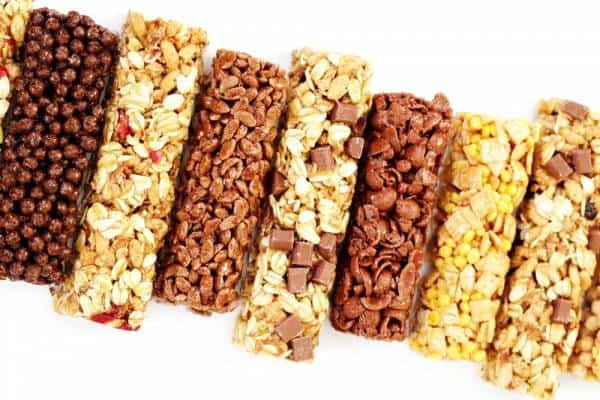 Energy bars also tend to be quite filling, despite their often small appearance. In the UK, Tracker bars are some of the most popular for people to take with them, and they come in several varieties – the most popular being nuts, and chocolate with nuts. There are some energy bars that are created for working out at the gym, and others that are made for hiking outdoors. While this is a perishable item, it is also packed with natural sugars and essential nutrients for slow-release energy throughout the day. Things like apples, bananas, oranges, and berries can be great for keeping your energy levels up, and can even assist in hydration. When you go to store them, however, make sure you wrap them in a cloth or a tea towel so that they stay safe and are less likely to perish during the day. If fresh fruit isn’t something you want to risk taking with you, however, then dried fruit can often be a good substitute. Things like dried apricots, cherries, and dates are all great choices. Hopefully, you have found this guide useful and have also decided to take some or all of these snacks with you on your next trip. It’s really important to eat the right foods while you are hiking, and so bringing the correct snacks is a great start. Of course, it is also essential to keep yourself hydrated on your journey, so make sure you bring plenty of water with you too. We love hearing from you, so please let us know what you thought of our guide in the comments below!